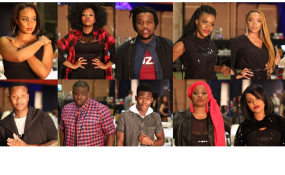 Meet the Idols SA top 10. It was a razzle-dazzle spectacular when Idols revealed this season’s Top 10 to an excited audience at the South African State Theatre in Pretoria, and the millions of viewers at home. South Africa held its collective breath tonight as 16 were cut down to 10, with host Proverb delivering news that was a blessing to some and a blow to others. But before the big chop, Group One’s eight contestants took to the stage one last time as a squad for a rendition of Bruno Mars’ 'That’s What I Like'. Soon enough, hearts were in throats as Proverb came on with a drum roll. Season 13’s youngest contestant, Paxton, was the first person to occupy a chair in the Winners’ Circle. She wasn’t alone for long, as Phindy, Faith and Thokozile joined her. The ladies were showing a strong presence. Lindo, Christo, Blessed and Gugu Zulu didn’t garner enough votes, leaving their faith in the hands of the Judges who had two saves to round off the Top 10. To give everyone a breather from the nerves, Group Two took to the stage to perform Black Box’s ever-green hit, 'Fantasy'. Soon after, Proverb delivered good news to the ecstatic Mthokozisi and Botlhale, who became the first guys to make the Top 10. After more heart-stopping pauses from Proverb, Thapelo and Tee got the thumbs up but Gabi, Hadassah, Basetsana and Minnie were left crossing fingers to be on the Judges’ “save” list. The Judges rounded off the Top 10 by saving Lindo and Christo, making it a clean sweep for all the guys in the competition. It wasn’t all frayed nerves and butterflies – Idols is a music show after all! Tonight’s line-up lit up the stage with popular tunes that were a welcome respite, including 'Gobisiqolo' by Bhizer featuring Busiswa, S.C Gorna and Trigger Bhepepe. Vusi Nova made his first big stage appearance after his assault, crooning 'Ndikuthandile'. 'Wayase' and 'I Never Quit' brought some dance moves with a medley of songs, and Sun-El Musician featuring Samthing Soweto entertained with 'Akanamali'. Idols 13’s new In-House Mentor, Donald, performed his hit, 'Raindrops' featuring the multi-talented and multi award-winning Tiwa Savage.